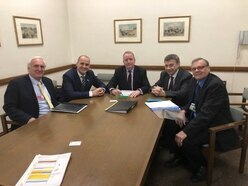 Wrekin MP Mark Pritchard met with the chairman of Homes England to discuss land in Shawbirch. Mr Pritchard met with Edward Lister and Minister for Housing Jake Berry to discuss the land north and east of the Shawbirch roundabout. The potential use of land already designated for development was discussed after controversial plans to build an industrial estate on the site were thrown out. Mr Pritchard, chairman of Homes England, Edward Lister, and Minister for Housing, Jake Berry discussed ideas for land north and east of the Shawbirch roundabout. Plans for the industrial estate were pulled by Telford & Wrekin Council following an outcry from residents and councillors. More than 1,000 people objected the proposal, which would have seen a building more than 130ft tall and covering 80,000 square metres of built on the site. The land is designated for development and Mr Pritchard spoke to Mr Lister about the potential for retaining it as farmland. Councillor Carter, who represents Newport on Telford & Wrekin Council, joined the meeting to discuss the potential for a high street funding bid in Newport, which he says could be used to renovate some of the older buildings.